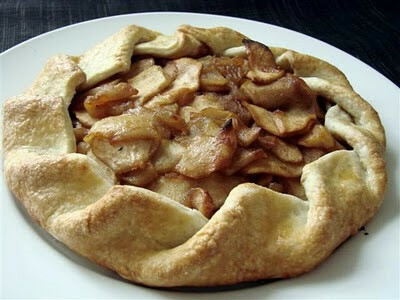 I combined a cream cheese, apple pie recipe and an apple gallete recipe to come up with this recipe. It was actually delicious and I served it at a ladies luncheon with caramel and chocolate sauce drizzled over the slices. It could also be served with ice-cream. It really is easy--don't let the pie crust fool you. This recipe makes 2 galletes. Mix flour and salt in medium bowl. With pastry cutter, cut shortening and butter into flour mixture until it resembles coarse crumbs. Add cold water and mix with a fork until it forms a dough. Do not overmix. Place in refrigerator while preparing filling ingredients. Melt butter in small saucepan. Add apples and cinnamon. Stir until apples are slightly cooked and tender, about 5 minutes. Divide pie dough in half and roll each into a cirlce (that would fit a 8-9 inch pie plate). Spread 1/3 the cream cheese mixture in the middle of each pie dough, leaving about 1 1/2 inches around the edge. Remove apples from pan with slotted spoon (to drain them) and spread half of them on top of cream cheese mixture. Fold the 1 1/2 inch dough over apples, overlapping at intervals (see photo). Repeat with second pie dough and apples.Place on parchment paper on a cookie sheet or non-stick cookie sheet. **NOTE: You will have about 1/3 the cream cheese mixture left over. I just discard. Bake at 350 for about 35 minutes. Remove and cool completely. Cut into 6 wedges.